A friend of mine called me to pass-by his place to check out his Decoder which was faulty, I passed by and the decoder was dead as dodo. Usually in electronics dead symptoms are mostly caused by power supply, therefore I suspected problem with the power supply. I did not have my tools with me and therefore I did not open the decoder on site, back to my workshop I opened it and the first thing I did was scanning for any sign of stress (blackened area or burnt components). Everything looked good and I was about to pull my digital meter to do some voltage testing when I noted a capacitor on the secondary side of the power supply which had it top slightly swollen. 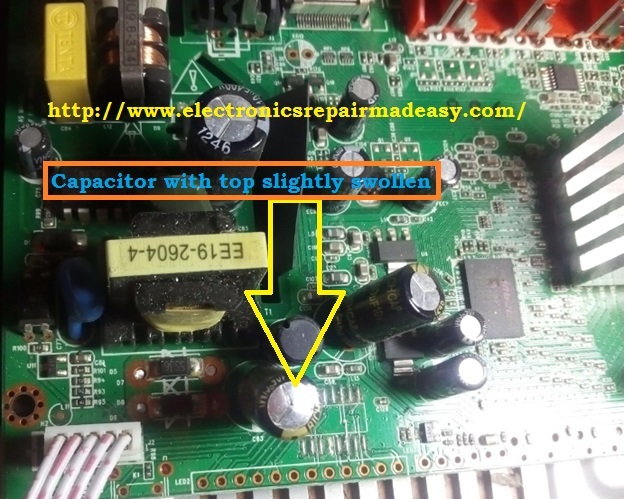 As I said previously and I repeat again, any capacitor with swollen top is usually faulty, this usually happens when the working voltage of the capacitor is exceeded. From basic electronics we know that a capacitor contain two plates (conductors) separated by a thin layer of insulating material called dielectric. If the working voltage of the capacitor is exceeded this insulator will get damaged and hence the capacitor will short circuit and hence get damaged completely. For the capacitor in our case, you realize that it was used to filter the secondary source (12Volts), therefore when this capacitor shorted means it created a jumper (short) between the 12 volts line and the ground. As you know a short on the secondary side of a switch mode power supply (S.M.P.S) can block the supply from starting and therefore I decided to replace the capacitor and see if there is any improvement. After changing this one capacitor and powered ON, the decoder came back to life and I was a happy man so was the customer. Thanks for your knowledge on capacitors and its behaviour.